Hello there readers! Winter is officially here in the south and this week it finally feels like it too, although my roommate still has the A/C on 75F so needless to say I’m typing this post in sweats and a hoodie. I figured since it’s that time of year this week’s post should convey the season I love and miss the most: fall with it’s chilly warmth and what says fall more than apples and what spice says warmth more than cinnamon. 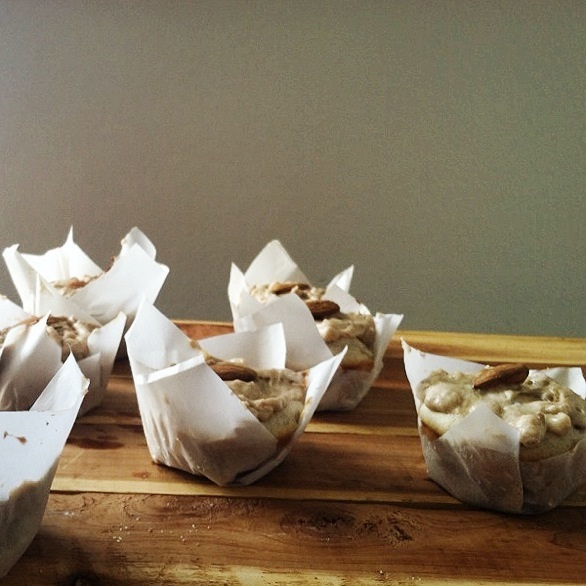 Behind the Scenes: When creating this recipe I wanted the cupcake to have an apple pie sense and it does! I thoroughly enjoy eating something that reminds me of something else. Also I’m a bit of a weirdo so sometimes I put the cupcakes in the microwave for about 10 seconds, especially with this one, that way it’s warm, heats up the apples and makes the frosting more like a glaze. 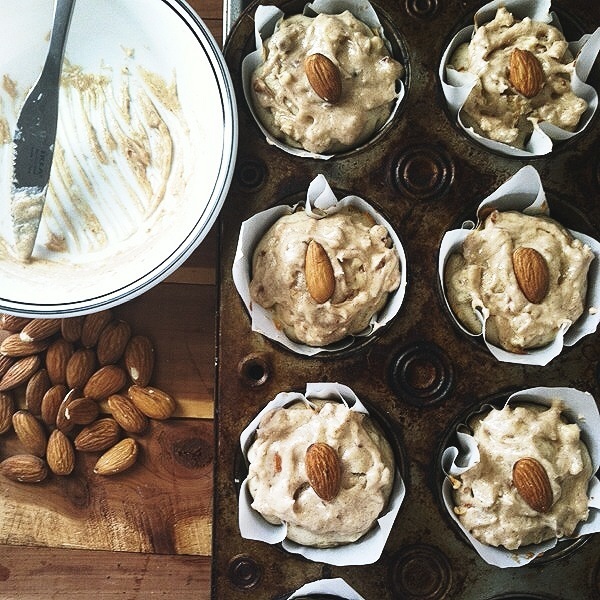 Side-note: This time I added almonds to the recipe. It’s completely optional and I rarely do this, but I wanted to show you guys an extra twist you could apply to this recipe. For some it may all look a little too brown so if you feel that way you can omit it. Bite not Mush: When it comes to this recipe and the apple’s cooking time you don’t want the apples to have the texture of apple sauce and you don’t want it to be crunchy like a regular apple, you want an aldente bite which can take anywhere from 10 to 15 minutes on the stove depending on how large you cut your apples or how many apples your using. If you want this cupcake to be mega apples then use two if you want there to be a bit of apple in every bite then use one, granny smith apples are already hearty and somewhat robust and large so one usually does the trick for me. Spice Up Your Life: In terms of spices I really like using cinnamon in combination with it’s cousin nutmeg, nutmeg is like the chocolate of spices, it has a more woodsy flavor and adds depth to any recipe you pair it with, and apples plus these two spices equals pure heaven. Ta-Ta-For-Now: So stop reading this, mostly because it’s finished, and start the baking! Preheat the oven to 350 F (175 C) and pre-measure out all ingredients. Chop apples into small squares (add some lemon juice to stop from browning). In a small to medium size sauce pan add 2 tablespoons of butter, when melted add the apples, cinnamon and nutmeg and cook for 10 to 15 minutes or until apples are aldente, once cooked, put apples into a bowl and let it cool down to room temperature. In a medium sized bowl, sift flour, salt, cinnamon, nutmeg and baking soda. In a large size bowl, cream together, with the hand mixer, butter and sugar, add the milk and egg mixture alternately with the dry ingredients. By hand, with a spoon or spatula, fold in the apples. I use an ice cream/cookie scooper so that the cupcakes are all the filled the same, if you don’t have an ice cream/cookie scooper then a kitchen spoon or tablespoon measuring cup will be fine as long as the same amount is in each cupcake tin to ensure even cooking time about 1/4 cup (4 oz.) of batter. Bake for 17 – 20 minutes (make sure you use a toothpick in different spots to make sure they are done, you may need to cook for an additional five minutes depending on how much water the apples let out). Allow them to cool on a cooling rack and proceed to make the frosting. In a medium to large size bowl, cream together your cream cheese, butter, and cinnamon followed by your milk. Once all combined, add your powdered sugar. Don’t do this all at once, each time you may need a different amount of powdered sugar to make the frosting texture you want, additionally everyone is different to texture and taste, so add until you reach your preference. 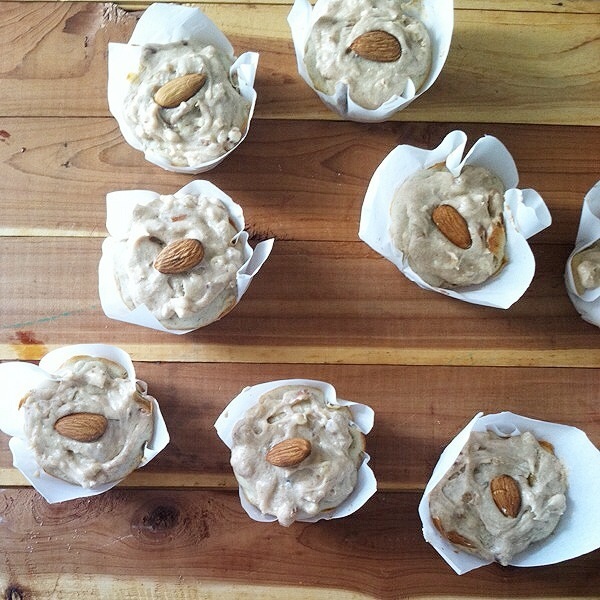 Then add the chopped almonds, because of the almonds it can be difficult if you want to pipe on the frosting for a more professional look, if this is the case, do not put the almonds into the frosting and just either sprinkle on top or leave out completely. Once all are combined, put the frosting in the fridge for about 30 minutes. Now that your cupcakes are cooled and your frosting is ready, spread the frosting on those fall time cupcakes and pretend that you are sitting by an open fire with Jack Frost nipping at your toes trying to get a bite of your cupcake.